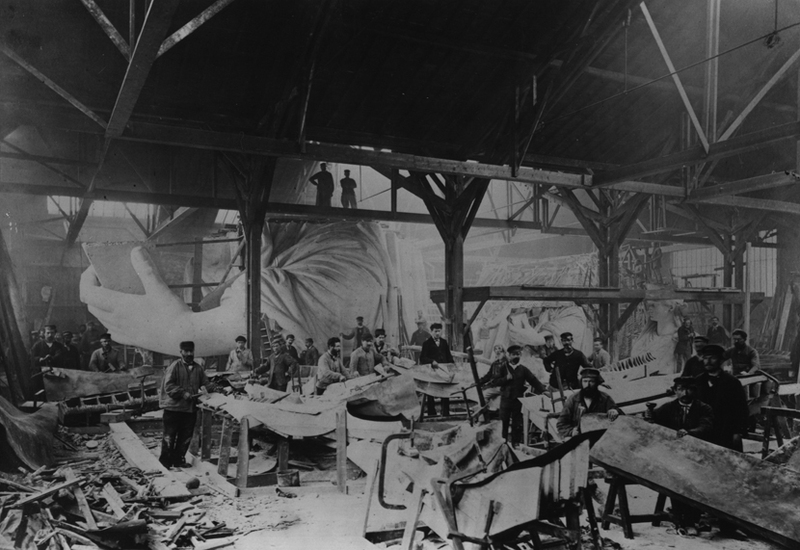 The Statue of Liberty turns 125 today, pictured here under construction in Frederick Auguste Bartholdi’s Paris workshop. Another Pompeii wall collapse? I’m skeptical of English-language reporting of what happens in Italy generally, but doubly so after reading Mary Beard’s account of a wall-collapse in Pompeii that didn’t actually collapse. Berlusconi screws up enough with out inventing things right? Maxwell Anderson will be leaving Indianapolis for the Dallas Museum of Art. Recovered 90 years later: “Fisherman’s Daughter” by Jules Breton, stolen during World War I, has been returned to France from New York. Probably not a good sign for his partner in crime: Jason Savedoff, the 24 year-old assistant to Barry Landau, has pleaded guilty to conspiring to steal valuable documents signed by Lincoln, Napoleon, and others. Deaccessioning art to another museum: The Atwater Kent Museum sold a work to the Philadelphia Museum of Art. Sounds like a reasonable solution to the slew of deaccessions. Serbia is the new haven for stolen art: two Picassos recovered there. The LCCHP is sponsoring an underwater cultural heritage conference Nov. 3 in Washington D.C.
At the Menil in Houston on Nov. 3 there will be a roundtable discussion of cultural heritage and participatory stewardship. The Four Corners region antiquities investigation has produced a number of probation sentences, no prison sentences and 3 suicides. The assistant U.S. attorneys would have had a hard time making a stronger case with the suicide of the informant. SAFE argues the non-custodial sentences are an unjust result, arguing for stiffer penalties. But in the current era of austerity, when some authorities are under budget constraints, sometimes even making the baffling decision not to prosecute domestic violence cases, who will pay to prosecute the cases? This is a good history footnotes about what happened in the past that really made great impact on the present days.